Will Facebook ever displace Google as a search engine? Not likely. But, it could quickly erode Google’s dominance as the way people find information. Above is a chart from a Wedbush presentation. 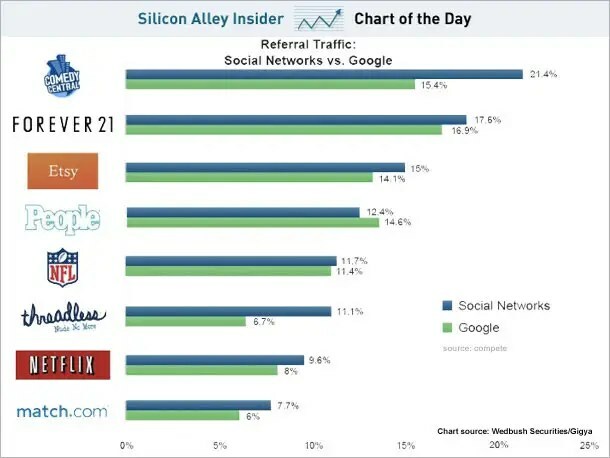 As you can see, the referral traffic from social networks to a number of big sites is greater than that from Google. Note it’s not just media sites, it’s commerce sites too. This is not a form of searching as we’ve traditionally thought of it. But, it’s certainly a way of finding information. So, Google’s lead in the world of search is probably safe, but its influence is at great risk.